Whether it’s rock, pop or classical that tempts your musical tastes you couldn’t help but enjoy the music performed in an intimate setting by the Bobby D Trio, with the silky sounds and brilliance of Steve Brien on guitar, the happening hammond organ sound and the righteous bass by Darren Heinrich, and Bobby D at the helm swinging the drums allows for one superbly professional outfit. The band is mainly instrumental and play all the great American standards from the 20s, 30s, 40s right through to the modern era, including Latin to funky grooves and jazz salsa. 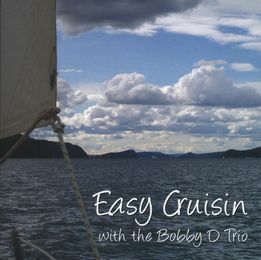 But for a change in tack the band features the chilled-out but warm bluesy vocals of Bobby D featuring songs from their latest album release Easy Cruisin with the Bobby D Trio, singing songs by Nat King Cole, Ray Charles, Mose Alison and others. These musicians have an incredible reputation for musical excellence, reliability and professionalism. They have worked with many of the great Australian and international performers and demonstrated their craft in concert halls, festivals, television, live radio, recording studios, corporate functions, bars, pubs and clubs, touring throughout Oz and overseas.